Single Fast Forty Multipurpose Naval Mounting. Photograph copyrighted by OTO-Melara. 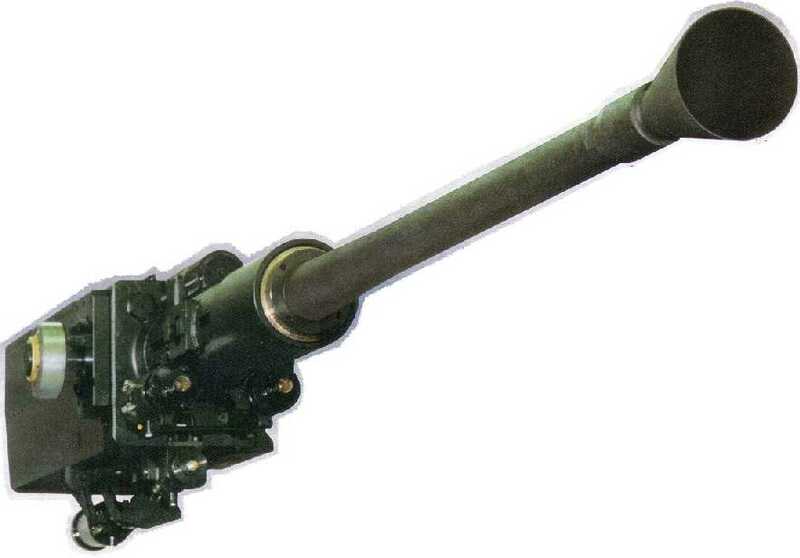 Developed from the Bofors 40 mm/70 Model 1948. In the 1960s, OTOBreda started building the Model 1948 under license from Bofors, but since that time they have developed many of their own versions. These are in general good weapons, having high rates of fire and some with dual-feed (HE and AP) capabilities. OTOBreda is now OTO-Melara. The "Compact" twin mount has been superseded by the newer "Fast Forty" which is available in both single and twin mountings. 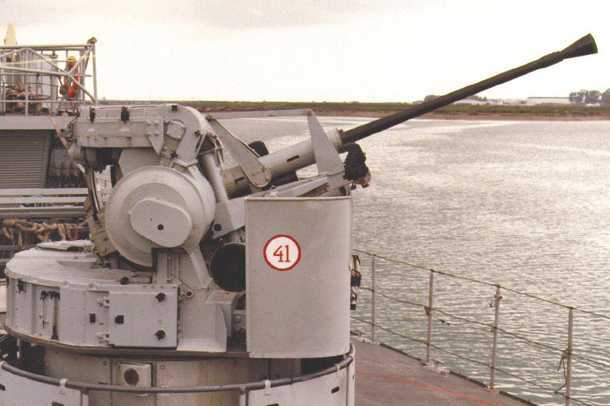 These guns are much faster reacting than the World War II era Bofors 40 mm/56, but perhaps their greatest feature, at least when used in the anti-missile mode, is their higher accuracy. 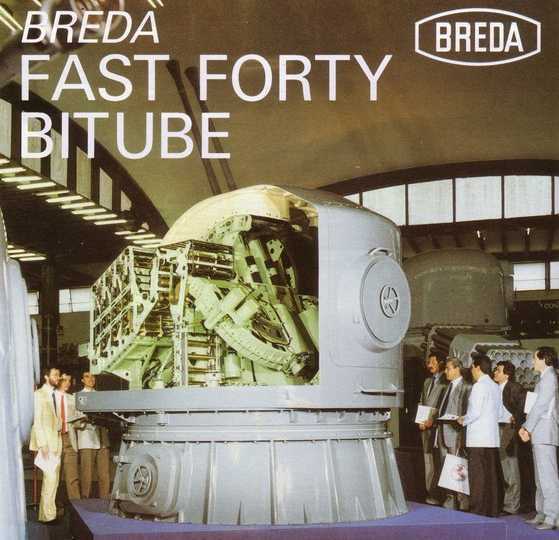 Breda claims that a twin Fast Forty, firing 900 rounds per minute, can kill an incoming supersonic missile flying in a straight line at ranges as great as 3,280 yards (3,000 m). The mount automatically switches from the lighter HE round to the heavier APFSDS when the missile reaches a range of 1,100 yards (1,000 m). APFSDS penetrator has a diameter of 0.43 inches (1.1 cm). The figure above is the "official" rating, but test firings have shown that this round can penetrate armor up to 5.3 inches (13.5 cm) at 1,100 yards (1,000 m). This weapon uses two OTOBreda 40 mm/L70 guns and is used on many types of warship from fast patrol boats to frigates. In service in Italian, Argentine, South Korean and other navies. Type A mount has a 736 round magazine with deck penetration. Type B mount has a 444 round magazine and no deck penetration. 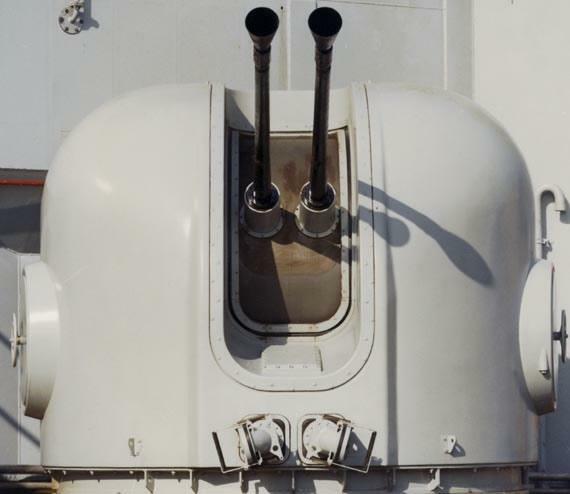 Tests conducted by the Italian Navy in 1976 indicated this weapon had 30% chance of destroying an incoming sub-sonic missile outside of 900 meters (1,000 yards). 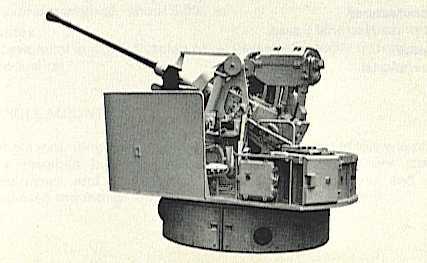 The successor to the Compact mount described above with dual ammunition feed and a higher rate of fire. 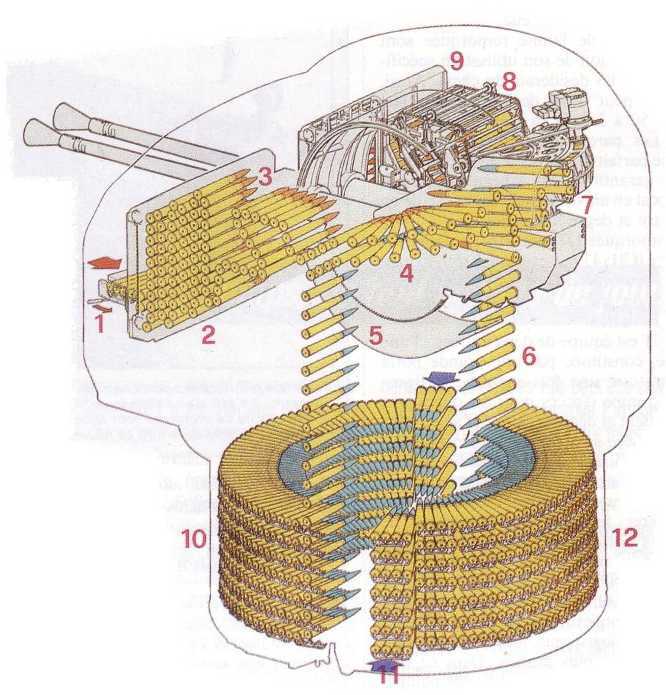 Dual feed mechanism to allow switch from PFHE to APFSDS rounds with two magazines per gun. Type A mount has a total capacity of 736 HE round with deck penetration for the mount. Type B mount has a total capacity of 444 HE round magazine and no deck penetration for the mount. Both types have a 200 round APFSDS magazine in addition to the HE magazine. OTOBreda claims that the twin Fast Forty using PFHE ammo can kill a supersonic missile at ranges up to 3,000 meters (3,280 yards). If a missile gets to within 1,000 meters (1,100 yards) the the weapon automatically switches from the PFHE to the APFSDS magazine. A single version of the Twin Fast Forty with similar specifications. 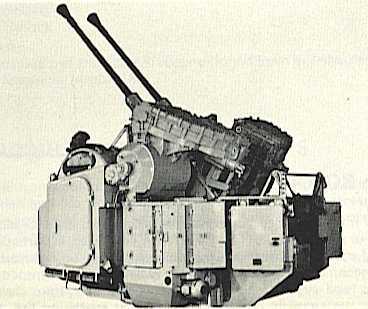 An earlier open topped twin 40 mm mount served from a 32 round autofeeder magazine that elevates with the gun or loaded from the standard four-round clip. Production started in 1969. These mounts were retrofitted to the German Hamburg class destroyers. 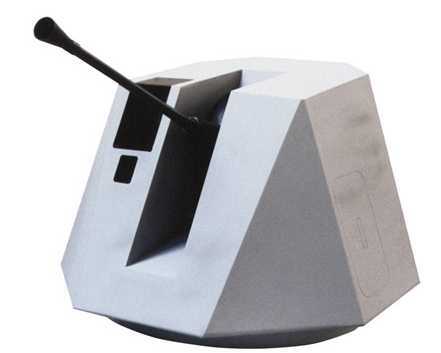 A single version of the Type 106. Data as for that weapon except weight as noted below. Also uses the 32 round autofeeder. 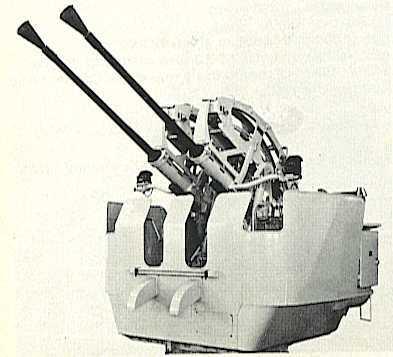 Twin mount with a 100 round magazine per gun. 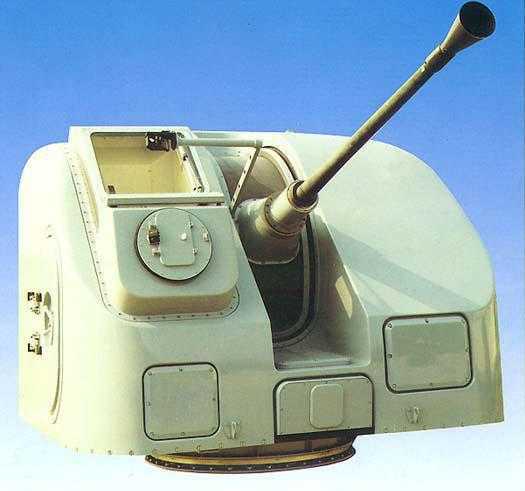 Advanced version of Bofors 40L70 Naval Gun with 144 ready rounds, digital servos and a fiberglass cupola. Available in both remotely controlled unmanned and single operator manned versions. 40 mm/70 Type 520. Image copyrighted by OTO-Melara. A single 40 mm/L70 using a 144 round Model 1971 automatic magazine. Crew is normally two on mount with one on standby, but some versions can be operated by a single operator. Marketed as the Breda/Bofors 350P and is analogous to the Bofors SAK 350 model. Also produced under license in Spain. 40 mm/70 Gun Assembly. Image copyrighted by OTO-Melara. Spanish-built 40 mm/70 OTOBreda Type 564. Photograph copyrighted by FABA (formerly IZAR). Twin Fast Forty. Photograph copyrighted by OTO-Melara. 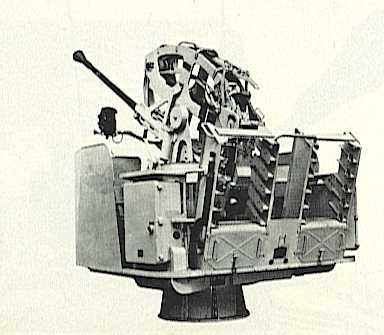 40 mm/70 Twin Cutaway showing ammunition feeds. Image copyrighted by OTO-Melara. Ammunition supply of Twin Fast 40 showing dual feeds. Blue-tip = PFHE. Red-tip = APFSDS.